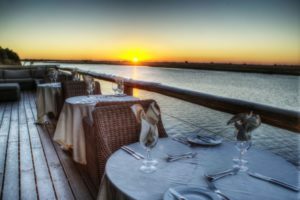 A mere 100 kilometres west of Victoria Falls, in the Riverine woodlands of the Chobe National Park, the luxurious Chobe Game Lodge overlooks the perennial Chobe River and Caprivi floodplains. Chobe Game Lodge is the only property in the Northern section of the Chobe National Park itself. Chobe’s wildlife is both abundant and diverse. It is home to arguably the largest concentration of elephant in Africa, and during the dry season these herds, along with large herds of buffalo, congregate along the fertile flood plains of the Chobe River. Guests are also likely to have excellent sightings of lion, wild dog, puku antelope, red lechwe, sable antelope, giraffe and roan antelope are also frequent in the area. 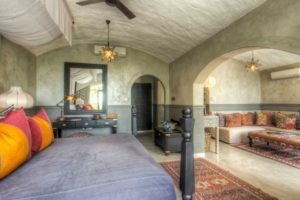 Chobe Game Lodge offers luxury, comfort and tranquillity for its guests. The architecture is graceful with high arches, and barrel-vault ceilings. All 43 rooms at the lodge are river facing and all have air conditioning, along with overhead fans. Each room also boasts a complimentary mini bar, en-suite bathroom and private terrace. 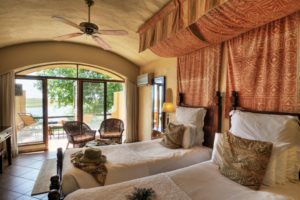 For those guests who demand the ultimate in exclusivity, Chobe Game Lodge has an additional 4 river view suites, each with a separate lounge area, and plunge pool. The rooms and suites are tastefully furnished – in hand crafted, Rhodesian Teak. 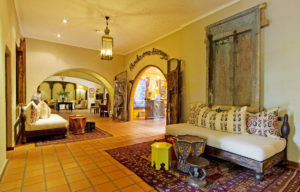 The décor includes original African carvings and paintings. “Love canopies” in hand-painted fabric have also been erected above all the beds. Guests enjoy their meals are enjoyed at the terrace restaurant, overlooking the Chobe River, or in the nearby boma (outside, reed walled eating area). Facilities at the lodge include a well-stocked curio shop and wildlife reference library. The stylish Thwene bar overlooks the floodplain. Broadband internet access is available for guest use. The Lodge’s other facilities include a large swimming pool with terrace. 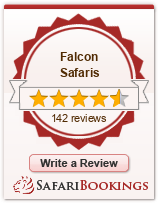 Safari activities at Chobe Game Lodge are tailored to suit individual requirements. Game drives are conducted in open four-wheel-drive vehicles, normally early morning and late afternoon and under the leadership of qualified guides. Excursions on the Chobe River are conducted in small, shallow draft and highly manoeuvrable boats, perfect for morning or sunset cruises. Guests can also enjoy the sunrise and sunset cruises aboard the Mosi-oa-Tunya river boat, which often provides spectacular wildlife viewing and is an excellent setting from which to enjoy the magnificence of an African sunset. The resident professional guides and environmentalist also offer star gazing. Guests can also pamper themselves by making an appointment with the in-house beautician or book the gym for a private work out. Chobe Game Lodge accepts children of all ages.